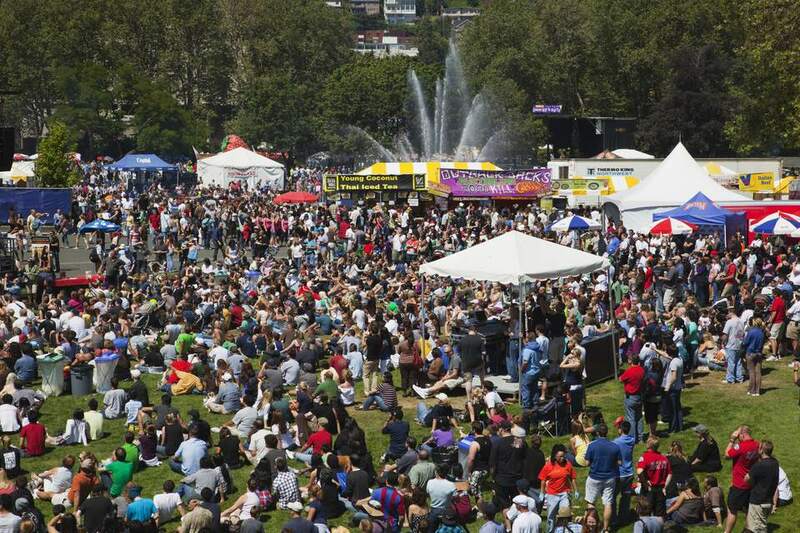 Out of the dozens of festivals and special events held at Seattle Center each year, the Bite of Seattle—a long-summer-weekend event that features the food and beverage offerings of dozens of local restaurants and producers—ranks among the most popular. Food is not the only attraction; you'll also be able to enjoy live music, cooking demonstrations, and family-friendly entertainment. This foodie delight is just one of ​Seattle's popular summer festivals. "The Bite" takes place on the grounds of Seattle Center, just north of downtown Seattle. While you're taking in all the tasty treats and quirky entertainment, you can take the opportunity to visit one or more of Seattle's major attractions, such as the Space Needle. The Bite of Seattle is a free event at Seattle Center. The food and drink, however, is not free. At least one lower-priced special feature is available at most vendors. Visitors to "The Bite" have the opportunity to indulge in tasty treats of all kinds, including entrees, desserts, fruit drinks, microbrews, and wine. You'll be able to sample a variety of different ethnic foods, including Thai, German, Greek, Filipino, French, Russian, and Hawaiian. Many of the food booths offer small portions, which allows you to sample several different items without busting your stomach or your wallet. Adults can savor an alcoholic beverage at one of the Bite of Seattle's beer and wine gardens. Beers of the world, Northwest wines, and brand-name cocktails can be enjoyed at designated locations throughout Seattle Center. You can rest your stomach between all those goodies by taking in live music and entertainment at one of Seattle Center's six stages. Rock-n-roll, swing, jazz, and reggae are just a few of the musical genres that will be offered from noon to closing each day. Keep an eye out for the free samples of stomach remedies. You might need some by the end of the day! Stay at a hotel near Seattle Center, and you'll be able to come and go throughout the day.